cook, bake, roast in Latvian style! - .andrushka.©. Latvian cuisine typically consists of agricultural products, with meat featuring in most main meal dishes. Fish is commonly consumed due to Latvia's location on the east coast of the Baltic Sea. Latvian cuisine has been influenced by neighboring countries in the Baltic region. Common ingredients in Latvian recipes are found locally, such as potatoes, wheat, barley, cabbage, onions, eggs and pork. Latvian food is generally quite fatty, and uses few spices. Grey peas and ham are generally considered staple foods of Latvians. Sorrel soup is also consumed by Latvians. A traditional Latvian cheese is Jāņu siers (caraway cheese); this is traditionally served during the celebration of Jāņi or midsummer. There is also a Latvian version of the smorgasbord, Aukstais galds. Latvia has an original version of pīrāgi, which are baked. Kvass (seen also in picture on the right) is often considered as a traditional Latvian drink, however it's quite popular in neighboring countries as well, and it is hard to establish its origin. Popular alcoholic beverages are beer, vodka and balzam. Sautéed sauerkraut is a food preparation that was inherited from Germans in the Latvian region. Pickled mushrooms are another Latvian speciality. Breads Rupjmaize is a dark bread made from rye, and is considered a national staple. 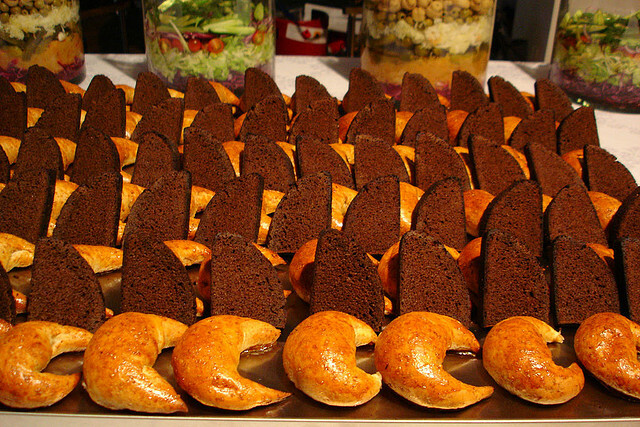 Kliņģeris is a sweet pretzel-shaped bread that is usually served as a dessert on special occasions, such as name day.